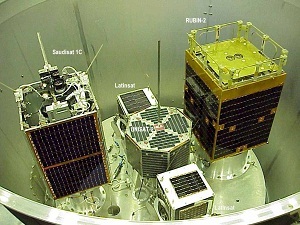 Saudisat 1C is a Saudi Arabian picosatellite that was launched by a Dnepr rocket from Baikonur at 17:00 UT on 20 December 2002. SO-50 carries several experiments, including a mode J FM amateur repeater experiment operating on 145.850 MHz uplink and 436.795 MHz downlink. The repeater is available to amateurs worldwide as power permits, using a 67.0 Hertz PL tone on the uplink, for on-demand activation. SO-50 also has a 10 minute timer that must be armed before use. Thus, first transmit an initial carrier with a PL tone of 74.4 to arm the timer. The repeater consists of a miniature VHF receiver with sensitivity of -124dBm, having an IF bandwidth of 15 KHz. The receive antenna is a 1/4 wave vertical mounted in the top corner of the spacecraft. The receive audio is filtered and conditioned then gated in the control electronics prior to feeding it to the 250 mW UHF transmitter. The downlink antenna is a 1/4 wave mounted in the bottom corner of the spacecraft and canted at 45 degrees inward. 145.8500 MHz FM, PL 67.0 Hz. Arm the timer with a 2 second 74.4 tone and after that use a 67.0 tone during the QSO on the uplink. Leave the uplink frequentie on 145.850 don’t correct the doppler shift.